Canterbury Bells Pink Campanula Medium is a beautiful biennial bellflower native to Europe. Canterbury Bells Pink seeds can be sown indoors in spring, and this Campanula Medium features the same attractive foliage with long sturdy stems as other plants from this family and produce bell-shaped, double, pink bellflowers. The flowering season is from spring to summer and lovely, pink-rose blooms add delicate touch of pink to a garden. Canterbury Bells Pink is widely grown in cottage gardens, sunny border and flower beds. 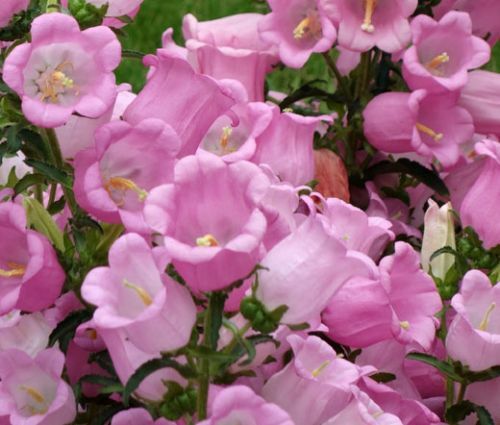 Campanula Medium seeds is an economical way to establish Pink Canterbury Bells, and this bellflower grows fast, enjoys full sun and well-drained soil, but does well even in partial shade. Canterbury Bells are impressive cut flowers that can last in vase for weeks. The plant self-seeds itself freely.